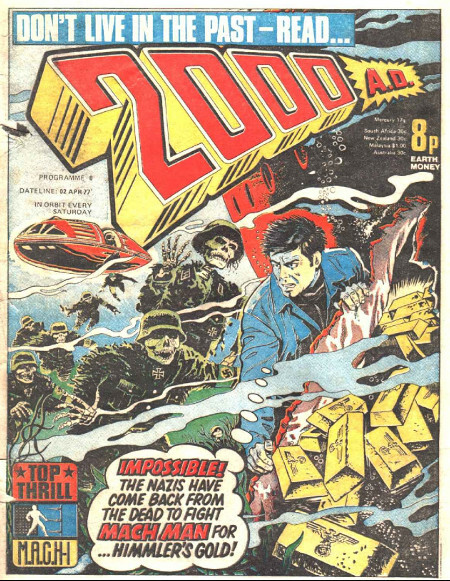 I can’t decide if issue six of 2000 AD has a great cover or a terrible one. It isn’t well drawn, but it certainly has... erm verve. I just swiftly Googled verve to make sure it means what I think it means, and I think it does. Verve: enthusiasm or vigor, as in literary or artistic work; spirit. Vivaciousness; liveliness; animation. 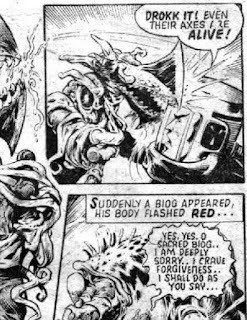 I write a lot about 2000 AD, it was a very formative experience for me, and I still read it today. 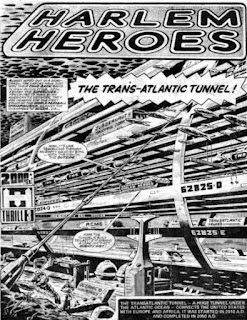 I have a 2000 AD page where I link to all the issues I have talked about on this site. 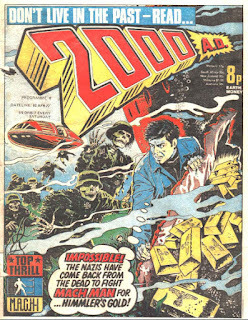 Yes, I think the word verve sums up this effort at a cover, where a guy in a denim shirt is fighting Nazi zombies. That sounds like fun, but my biggest problem with it is that it doesn't scream sci-fi to me. 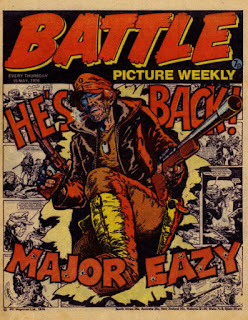 It probably didn’t stand out very much from the rack upon rack of all the other war comics aimed squarely at adolescent boys in the late 1970s. Comic books like Battle, but that wasn’t the only one. 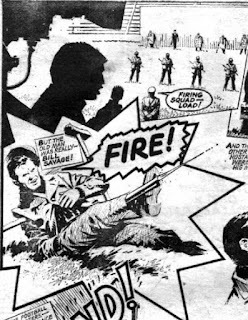 Inside the comic, the first story, Invasion, is luckily drawn by an artist who is much better than whoever knocked out the cover. I recognize the work of Carlos Pino, who a couple of years later will go on to do Ro-Busters for Starlord. 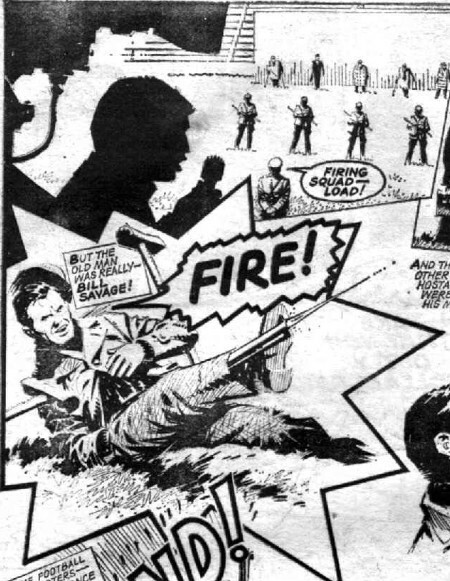 The story has an inventive moment when Savage hides a rifle down his pants, but as usual it doesn’t really make a lot of sense. It seems to be equating armed resistance against an invading power to football matches - including calling the engagements games, and having fans chanting. It’s strange, to say the least, and there really isn’t a lot if sci-fi in it. The next strip, Flesh, couldn’t be more different. 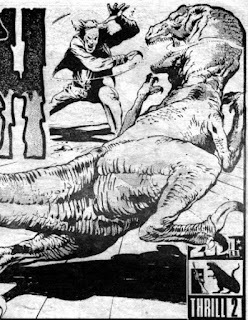 While you could imagine Invasion appearing in any of the boy’s action comics of the time, the same cannot be said of Flesh. This is a story about cowboys going back in time to hunt dinosaurs and send their meat to the future. It is high concept, high action, and high gore. This episode starts with a cowboy facing down a deinonychus, and it was drawn before anyone suspected these beasts might be covered in feathers. I have complained about dinosaur feathers before, groaning about how science ruins everything, but I am slowly coming round to the idea of feathered dinosaurs. Still, it’s nice to see one drawn the old way, scaly and reptilian. In an unlikely display of fighting skills, the evil cowboy, Claw Carver, defeats the monster, and this is just the start of an entertaining action-packed and bloodthirsty episode. Cowboys get eaten, a town gets burned down, and there is a hugely enjoyable double cross from Claw Carver right at the end. Good stuff. Next comes Harlem Heroes, drawn by Gibbons, and I sometimes don’t give this artist the credit he deserves. 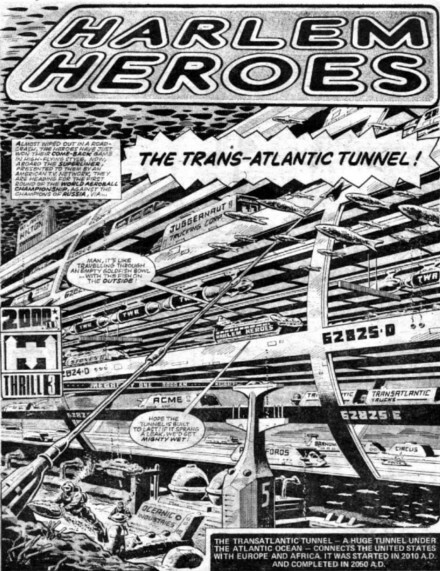 The first page of this story, an amazingly beautiful drawing of a transatlantic tunnel, is just breathtaking. It has O’Neil levels of detail, but a more naturalistic style. The art inside is to the same level and there is plenty of action. 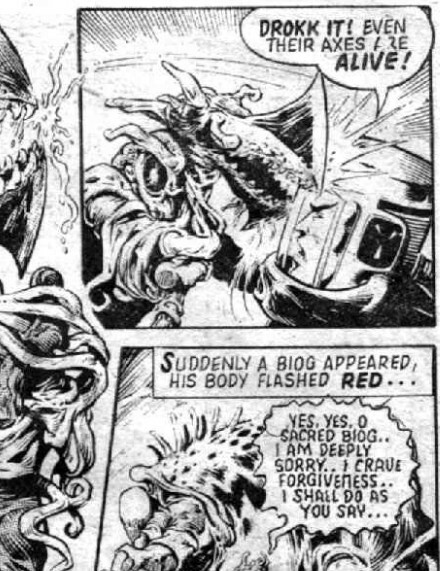 Next comes Dan Dare drawn by Belardinelli and it is an interesting exploration of an alien ecosystem within a gas giant, but with crazy ideas like living axes. 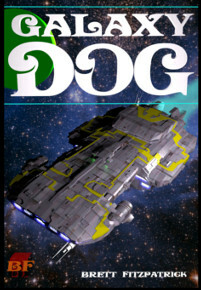 Another very pulpy idea is that the alien inhabitants of the gas giant need humans for fuel. It is stupid and fun and imaginative and I wasn’t expecting anything with quite so many monsters and fantasy elements form boring old Dan Dare. I’m pleasantly surprised. MACH 1 is the story that follows and it is about a very 70s obsession, Nazi Gold lost in a ship that went down in Lake Constance on its way to bank vaults in Switzerland. The cover promised us zombie Nazis, but that was a fake out. 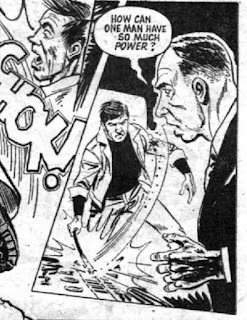 Some Nazi corpses get moved by divers in one panel, and MACH 1 thinks they are alive for precisely half a second. It’s a disappointing story, and it certainly didn’t deserve to be on the cover. Next comes Judge Dredd, and the story idea is a bit weird. Apparently people can live virtually forever via transplanting, so it has been banned. That’s the only explanation we get for why transplants are illegal before we are introduced to body hijackers working for Dr. Frankenstein II. 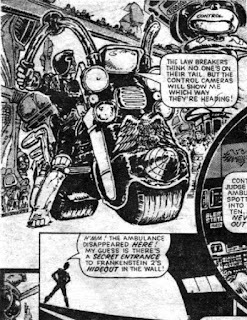 The story shows Dredd staying on their tail with the help of a tram monitoring CCTV. I guess this was futuristic at the time, and our surveillance technology is still not quite up to the feats seen in this story, but we are moving ever closer to this kind of pervasive surveillance. The art looks like it is done by Mike McMahon, while still learning his craft from copying the work of Ezquerra. Not a classic issue of 2000 AD, but very enjoyable considering this is only issue 6, and the comic book will go through a lot of evolution from here.